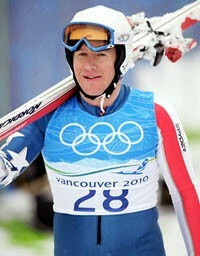 Marco Sullivan was born April 27, 1980 and is a World Cup alpine ski racer from the United States. Born in Truckee, California, he competes primarily in the speed events of Downhill and Super G.
Sullivan competed in the 2002 and 2010 Winter Olympics, and four World Championships. He has won one World Cup race, a downhill in Chamonix, France, in January 2008. Sullivan was the Downhill champion at the U.S. Alpine Championships in 2007 in the Alyeska Resort in Alaska; he finished more than a full second ahead of runner-up Erik Fisher. During the 2012 season, Sullivan has written columns for SKI mag.com, giving insight to life on the World Cup circuit, which includes spending Christmas in Bormio. Olympians are the best at what they do. Dedication, training as well as going above and beyond to represent their respective countries. The booking agents at AthletePromotions can easily assist with booking Marco Sullivan speaking engagements or appearances from some of the top Olympic gold medalists. We have years of experience in booking Olympic athletes for VIP Meet & Greets, keynote speeches and autograph signings. Hiring a Olympian like Marco Sullivan is a very easy process. Our team can provide fees, availability and all costs associated in bringing out an Olympian to your next big corporate event. We can easily find Marco Sullivans agent to make your next event the best it can be.A Marco Sullivan appearance will be sure to reward your companys employees, customers and clients. Most likely, Olympic fans and corporations can find Marco Sullivan's official website, charity involvement, Twitter account, representation, publicist and management info at www.Marco Sullivan.com.